Ändert eure Stimme in Echtzeit zu jeder beliebigen Stimme. 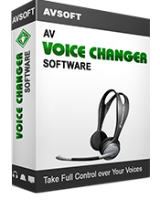 AV Voice Changer Software 7.0.62 war am 10. November 2018! als Giveaway verfügbar! AV Voice Changer Software hilft euch, eure Stimme in eine beliebige Stimme umzuwandeln können, während ihr Skype / Discord oder eine andere VoIP-Software verwendet. Ein Klick auf Stimmeinstellungen, die als „Nickvoices“ bezeichnet werden, von männlich zu weiblich sowie weiblich zu männlich reicht. Neben dem Alter und Geschlecht könnt ihr über hundert Spezialeffekte und Hintergrundeffekte verwenden. Darüber hinaus enthält die Software einen integrierten Voice Recorder, mit dem ihr Audiodateien sowohl mit normaler als auch mit einer Morph-Stimme aufnehmen könnt. 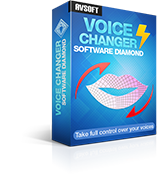 AV Voice Changer Software Diamond with 60% OFF, one day only! Die ultimative Version mit mehreren Nickvoices, mehr Effekten, einer neuen Benutzeroberfläche und den herausragenden Tools für jeden Bedarf der Benutzer. Voice Editor und File Morpher sind insbesondere beim Bearbeiten, Verwandeln und Konvertieren von Audiodateien eine große Hilfe. Mit Abstand das beste tool, das ich auch nicht brauche. Keinen Dank! Now here is where there was a problem, the software changed the speaker from high definition Audio device to Avnex virtual Audio device, so what I did was to select the high definition Audio speaker and sound was recovered. so whoever will face the same problem, to me that is how I fixed it. but I have never tried the software so I am not sure if it will work in the different speaker. After installing an app, my laptop lost sound, my videos were not producing any sound, music or anything, I went to the taskbar speaker the icon showed it is at the highest volume though I did not hear anything, I went to the volume setting it was not muted, I eventually figured out that the AV Voice Changer Software was the source of all the problems, I thought of uninstalling but I didn't, instead I went to setting > system > Sound > App volume device preferences Now here is where there was a problem, the software changed the speaker from high definition Audio device to Avnex virtual Audio device, so what I did was to select the high definition Audio speaker and sound was recovered. so whoever will face the same problem, to me that is how I fixed it. but I have never tried the software so I am not sure if it will work in the different speaker. I get you wanna promote your software here, thats great and wonderful, however why are you offering such an old product, I Was going to download and check it out until I saw it was an older version, this hurts your business more than promotes it, not downloading or installing. Thanks but no thanks. Just to clarify for everyone, the "Product Specifications" on audio4fun's GOTD webpage says the program requires Vista or above; XP is excluded. However, that being said, I tried it on my old XP SP3 and it seems to install and run fine. Reminder to everyone: Uncheck "Enable autoupdate" in Preferences. Just to clarify for everyone, the "Product Specifications" on audio4fun's GOTD webpage says the program requires Vista or above; XP is excluded. However, that being said, I tried it on my old XP SP3 and it seems to install and run fine. Reminder to everyone: Uncheck "Enable autoupdate" in Preferences. My Smart Phone does this and more, for free. Why are you giving us the 'Basic' when we could be having 'Gold' or 'Diamond'? I think you are being a bit mean. Musicool1, Not to mention the fact that the newest version is 9.5.21; why are we getting and extremely old 7.0.62?